On the northeastern part of the Qinghai-Tibet Plateau, Qinghai is a province inhabited by many ethnic groups. Over the past years, the Han, Tibetan, Hui, Mongolian and Salar people have developed a wide variety of local snacks by using local products, forming the unique plateau catering culture. Prepared with simple ways, Qinghai snacks feature strong rural flavors. It is a popular local snack of Qinghai, pulled with hand in the shape of a fingernail. Such dough strips are white, refreshing, soft and delicious. Niangpi is a special local snack of Qinghai. Xining Niangpi has its own characteristics. With special seasoning, Niangpi, golden yellow in color, is spicy, refreshing, sour and richly fragrant, which will arouse pleasant feelings on the tongue. It may serve as staple food or a dish. Tourists may taste it at any time in a year. It is the most famous snack of Qinghai Province. Thanks to its unique environment. cattle and sheep growing on the plateau offer high-quality, fat, tender and delicious meat, in addition to special pleasant aromas. Eating mutton with fingers, a primitive way of eating, will make people feel they recover their original purity and simplicity. As a cold drink on the plateau, yogurt is well received by the people all over Qinghai Province because it is as white as ice cream, as smooth as fair and delicate skin, and as tasty as litchi. As a local snack created by the Hui people in Qinghai Province, such noodles can be eaten hot in winter, and cold in summer. 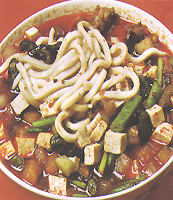 Noodles are soft, smooth and golden yellow in color; and sheep intestines are tender, crisp, white and delicious. It is a famous snack with a strong local flavor. As a traditional food of To ethnic minority, baked cakes, made with fermented flour, are usually presented to the people or monks of temples and monasteries who come to the To village on festivals. Soft, crunchy and crisp, baked cakes are prepared in a unique way, with a special flavor.